the seasoned first timer: Maldives on a Budget? Yes, its Possible! Maldives on a Budget? Yes, its Possible! I've been meaning to share this last post about our Maldives trip for quite sometime now but never really had the chance to finish it due to work and too much traveling! Not that I'm complaining since exploring new destinations and going back to places I love are the things that I live for. Since I'm still getting questions from friends if Maldives is indeed an attainable destination for a working class citizen like myself, I might as well do a breakdown of expenses to prove that you can also visit and enjoy Maldives for Php30,000 or even less! Before we proceed, let's clarify first on what I mean by Maldives on a budget. Most people may ask, how can it be considered as a budget trip if you're still spending Php30,000 for a 4-day stay? Sure, that same amount can get you elsewhere for a longer stay or can fit more people into the budget but hey, its M-A-L-D-I-V-E-S! The once "just a bucket list" destination can now be attained if you just know how to plan it right. This trip was over a year ago so please bear with me as I try to recall as much information as I could to help you achieve that dream trip. Maldives is located in the middle of the Indian Ocean. To get to Male, you have to travel to Kuala Lumpur or Singapore first because there's no direct flight to Maldives' capital coming from Manila. I came across an Air Asia promo for around Php7500/person but for the KUL-MLE-KUL sectors only. We have to book another flight out of Manila that connects to the flight to Male at 6:55PM which, unfortunately that time is via Malaysia Airlines only. Arriving a day before is another option but as we only had a few days to spare, our only option is to find a flight that connects. Malaysia Airlines is a full service carrier and not a budget airline which means that fares are not budget friendly. However, we got lucky and was able to book round trip tickets for just Php8000 each inclusive of PH travel tax! To make sure that we get to the Air Asia counter on time, we all decided to just bring a handcarry so we can run from KLIA (where MH arrives and departs) to KLIA2 (where Air Asia is based) as soon as the flight arrives. As I've mentioned on my post about Kaani Village and Spa, there are quite a number of options nowadays if you wish to travel to Maldives on a budget. Since the opening of local islands to tourists from all over the world, it had been more convenient now to find an accommodation that fits right to your budget. 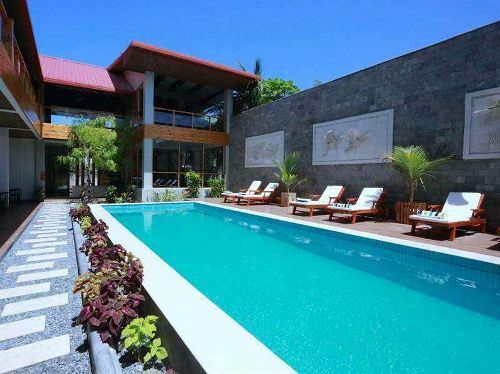 Several resorts in Maafushi, our island of choice, offers comfortable accommodation at affordable rates that range between Php4000 to Php9000 per night. To reach Maafushi from the airport, you have two options: (1) take the public ferry boat for $2.00 per person or (2) arrange a private transfer from your hotel for $160 - $200 per trip. In our case, we booked a deluxe family room with balcony for Php7940/night inclusive of daily breakfast and extra bed. Not the cheapest option but having our own balcony that provides a partial view of the ocean is worth every centavo. For the transfers, we had to arrange a private speedboat as our flight arrived late and we wanted to proceed to Maafushi right away. As Maldives is surrounded by waters with abundant marine life, I thought I'd be traveling to seafood heaven where I can eat lobster and prawns everyday! I even allotted a handsome portion of my budget for it because if there's one thing that I allow myself to splurge, its a great and amazing meal. Well, Maldives proved me wrong the very next day because aside from Mas Huni, the traditional Maldivian breakfast of tuna, coconut, chill and onions, there's hardly any fresh seafood to order in restaurants due to government's strict control over fishing and as one of the staff at Kaani used to say, Maldivians would rather work as tour guides rather than go out fishing. Another reason why we chose to stay in Maafushi is because there's a wide variety and cheaper food options as compared to staying in a private island resort. You can buy snacks and drinks in one of the local stores like the one below along the island beach front. Restaurants are inclined to offer more Western cuisine to its menu to cater to an international clientele. Stores also prefer tourists to pay in US Dollars than Maldivian Rufiyaa so better hold onto your $$$ and just change a couple of hundreds for transportation and tip. Ala carte dishes in Maafushi range between Php300 - Php500 depending on your order. Prices for seafood and meat dishes are quite the same so just order what your heart desires. To save even more, you can just bring a complimentary bottled water from your hotel rather than ordering one at the restaurant. However, if its alcoholic drinks you are looking for, remember that Maldives is a Muslim country so alcohol is not allowed except at the private resorts, far from the local islands. In Maafushi, there are four beaches that you can visit for free: Bikini Beach, Public Beach, Water Sports Beach, and Coral Beach. Tourists usually go to Bikini Beach because its the only beach in the island where you can wear a bikini as it is illegal to show off too much skin in public. If you want to explore farther, you can also arrange tours from your hotel or one of the local tour agencies scattered around the island. In our 4 days in Maldives, we were able to enjoy the local island life, visit a private and exclusive resort, go snorkeling with the turtles, saw a variety of colorful fishes underwater, and swam in one of the whitest beaches I've ever seen! So there you go! You can now start planning your trip to Maldives to give yourself enough time to save a portion of your hard-earned money for a well-deserved vacation. Good luck and enjoy!